I wonder if it’s because of my origins that I love olives from Spain or if it’s because of my father who loves having some with each meal or if it’s a bit of both. The Mediterranean olives are among the most popular and I am lucky to have been able to grow in this climate in order to enjoy it but also to have less harsh winters (ah, the good time!). When Olives of Spain challenged me to reinvent a recipe using the olives they offer, I imagined so many dishes (healthy, of course) that it was difficult to select one. I ended up opting for a chicken bread with Spanish olives, dried fruits and nuts. Yes! So good, so rich and so festive. You can adjust the recipe according to the ingredients you have. This is also the beauty of cooking. This recipe is perfect for your weekdays but also if you are hosting I also think it’s the perfect timing to publish this recipe for this holiday season. 2 tsp of piri piri spice (from @aspiceaffair). Dried apricots, pistachios, Spanish olives (Manzanilla variety, stuffed with pimientos), dried cranberries. Since I had chicken breasts, I chopped them in the blender. Add the spices, the breadcrumbs, the eggs and the onion and mix everything. Take some of the nuts, dried fruits and stuffed Manzanilla olives from Spain and incorporate them into the mix. 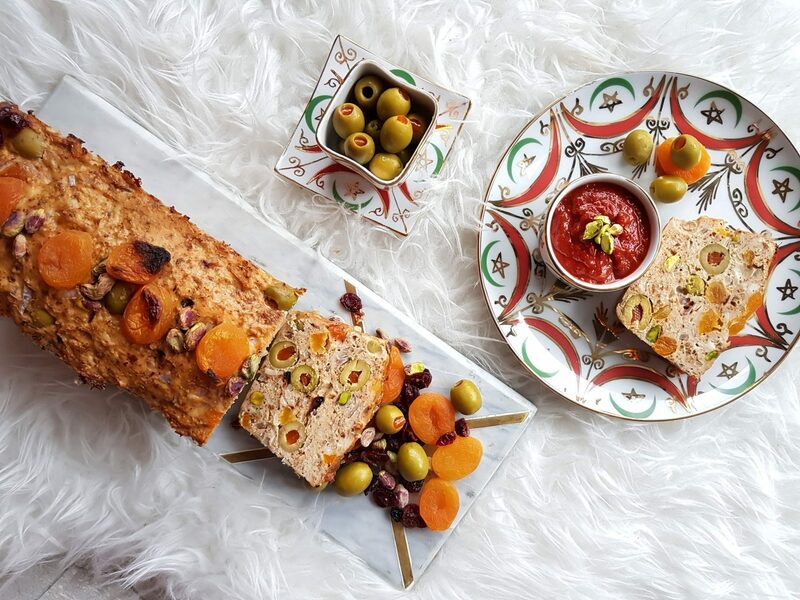 Put everything in a mold (cake mold) and decorate with other apricots, cranberries, pistachios and olives from Spain. Put in the oven for about 45min at 350F. The cooking time depends on the meat you have chosen to use. Whatever your choice, I advise you to check the cooking from time to time, otherwise the result will be too dry. Serve it all in slices with a caramelized tomato sauce (salt, oil, piri piri, cardamom, honey and fresh ginger, cook until caramelization). Trust me, the result is not only beautiful but delicious. The Spanish olives stuffed with red pepper are the perfect choice for this bread because the chicken goes well with grilled peppers. The good news is that you can prepare it in advance and freeze it (without cooking it) and put it in the oven when you host or when you need it.